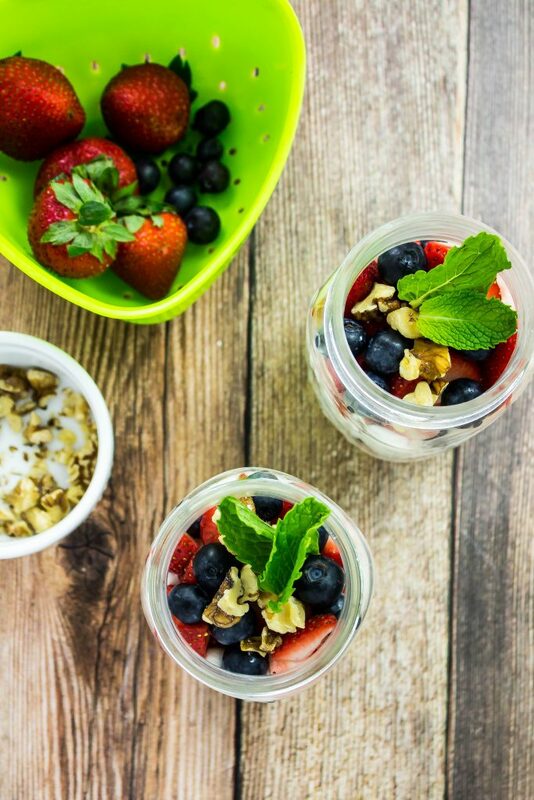 Red White & Blueberry Yogurt Trifle is Greek Yogurt layered with fresh berries & nuts is sure to satisfy your sweet tooth. Weight Watchers friendly- 3 SmartPoints! Over the years, I’ve built up quite a sweet tooth. I am typically more of a savory person… I prefer chips over chocolate, but recently I crave something sweet after dinner. 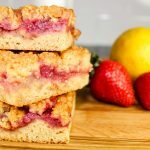 Dessert can be a hard to manage on Weight Watchers but I have the perfect dessert that is guilt free. My Red White & Blueberry Yogurt Trifle is a quick and easy dessert or breakfast packed with delicious ingredients. 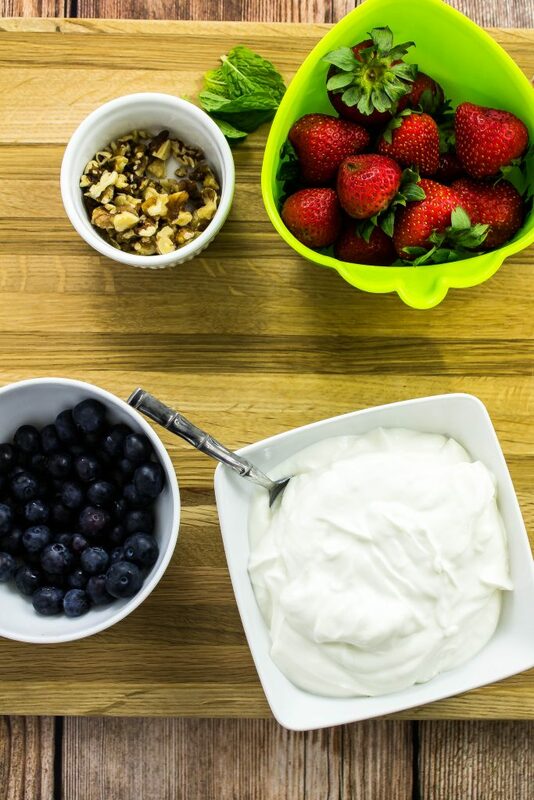 Vanilla Greek Yogurt layered with fresh blueberries, strawberries, and walnuts is sure to satisfy your sweet tooth. Super healthy and Weight Watchers friendly with only 3 SmartPoints per serving! I’ve been eating this dessert for years and a while back finally introduced my husband to it. I hate to admit it, but I’ve converted him into a “dessert after dinner” person. He swears he never used to eat dessert until we moved in together. I just crave a piece of something sweet after dinner… don’t you? Rather than grab that ice cream bar, I make this dessert. Its super low in Weight Watchers SmartPoints which means I can eat a larger portion for dinner and still have enough points for this delicious dessert. 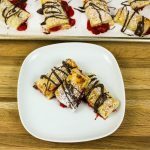 Another great thing about this dessert is that is doubles as breakfast! Seriously…. 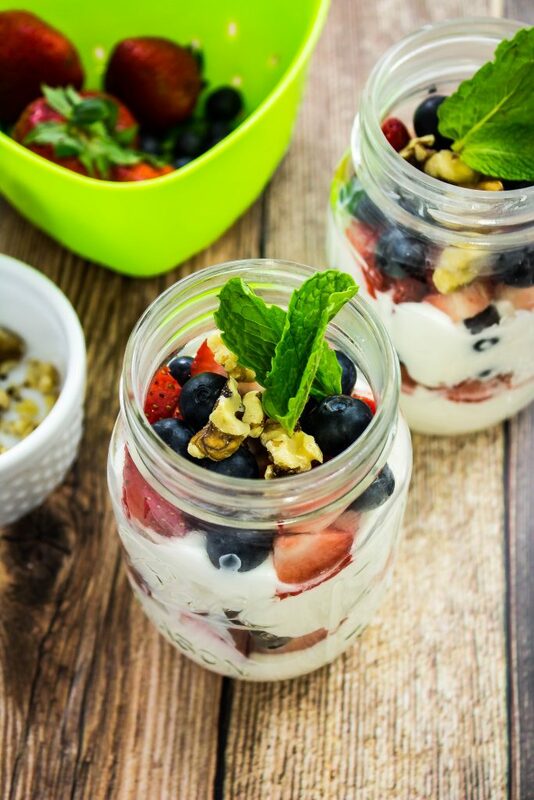 I like to make several of these desserts in mason jars, store them in my refrigerator and take one to work with me for a delicious and healthy breakfast. This recipe is almost too easy to make. I recommend using mason jars to store and serve this dessert. If you don’t have mason jars, no problem! Just layer all the ingredients in a bowl. To start, dice up fresh strawberries, blueberries, and walnuts. Into the bottom of a mason jar, add ¼ cup fat free vanilla Greek yogurt and smooth out. Next add 1/8 cup of blueberries, strawberries, and walnuts. Add another layer of yogurt and smooth out then top with more blueberries, strawberries, and walnuts. If you are going to serve right away, I like to add some fresh mint on top for a pop of color. If you are going to enjoy the dessert later, just seal the jar with the lid and store in the refrigerator for up to 2 days. 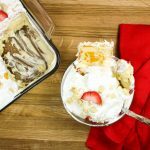 Red White & Blueberry Yogurt Trifle is a quick and easy dessert or breakfast packed with delicious ingredients. Vanilla Greek Yogurt layered with fresh blueberries, strawberries, and walnuts is sure to satisfy your sweet tooth. These dessert would be SO PERFECT to serve for Fourth of July. Super festive and refreshing on a hot summer day. 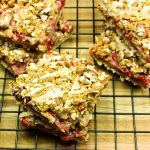 3 Weight Watchers SmartPoints per serving! Wash blueberries and strawberries and let dry. Dice strawberries and set aside. In a mason jar, scoop ¼ cup Greek yogurt into the bottom and smooth out. Add 1/8 cup blueberries, 1/8 cup strawberries, and ½ tablespoon walnuts. Scoop ¼ Greek yogurt on top of berries and smooth out. Garnish with fresh mint on top. If storing in refrigerator, cover jar with lid. Yogurt will stay fresh for 2 days. June 29, 2017 at 12:08 pm YUM! This is so perfect for 4th of July! I love how simple this is. July 3, 2017 at 9:08 am Thank you Jennifer!! July 3, 2017 at 9:08 am Thanks so much Jocelyne!! June 29, 2017 at 12:33 pm I looove yoghurt with fresh strawberries in the summer, I'm so happy it's strawberry season again! This dessert is totally gorgeous! July 3, 2017 at 9:07 am Me too Laura!! July 3, 2017 at 9:07 am Thanks Corey! June 29, 2017 at 3:08 pm Love the color, love the jar vehicle and perfect for the holiday! Thanks! July 3, 2017 at 9:07 am The jar makes it perfect to serve it! June 30, 2017 at 8:13 am Looks yummy! I love all the fruity summer desserts. July 3, 2017 at 9:07 am Thanks Brittany!